Ahhh concealer, my favourite makeup product. I’ve tried a fair few over the years and I thought I’d compare three of my favourites. First up we’ve got the newest concealer to my collection, the NYX HD Studio Photogenic Concealer. One I’d seen floating around the blogosphere since NYX came to the UK. The first thing I noticed with this concealer, is the consistency was quite a lot thicker than any of the other ones I’d tried, which made quite skeptical as to whether it’d look cakey or not. Nonetheless, once blended out all is well. I think it blends out best with a beauty blender, rather than a brush, as I think if its applied with a brush it does come out a tad more cakey. I hope I’m making sense haha. The only negative I could see with this was the colour. This is the shade porcelain, the lightest shade and it was still a tiny bit dark for my skin tone. Next up, probably my holy grail concealer. The Seventeen Stay Time. This is a concealer I’ve been using for a very long time now. Well over a year I’d say. Its just soooo good. The consistency is much thinner than the NYX one, which does make it easier to blend. They even have the shade ‘extra fair’, which is so perfect for my skin tone. Being pale as it is, its hard to find a concealer that can highlight and brighten your under eyes, but this manages to do just that. However, the coverage isn’t quite as good as other concealers, but I’m willing to look past that due to how much I love it overall. 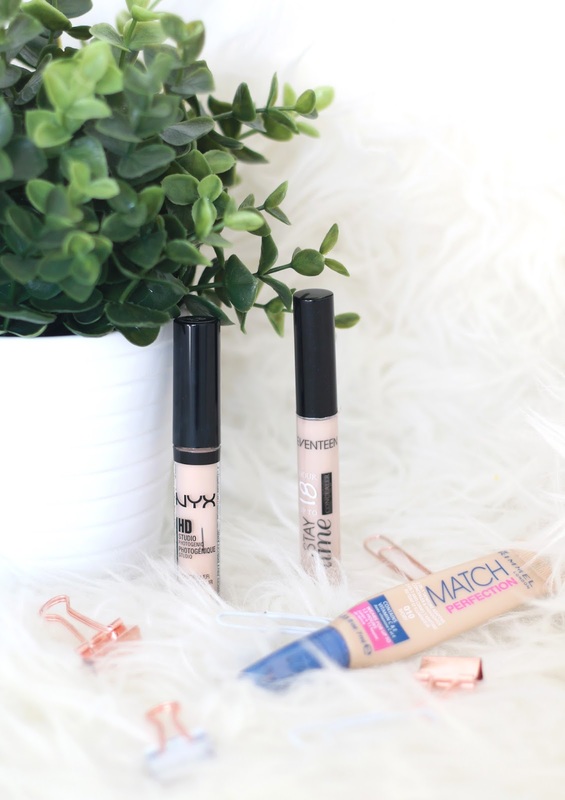 Lastly, we have the Rimmel Match Perfection concealer. I had a real love hate relationship with this concealer at first. The very first time I tried it, I loved it, got on with it so well blahblahblah. Then didn’t repurchase it for another year or so, where I didn’t like it. Whether they changed the formula or something, I don’t know. The lightest shade they do in this is Ivory which is kinda a bit dark for me. Its okay, but not as good as the previous two. Anyway, when Boots had none of the concealers I wanted except this one, I decided to give it a go again. And I was pleasantly surprised. It gave great coverage, and blended really nicely. If you have a bit of a darker skin tone, I assume this would brighten under the eyes really well. The coverage is great as well, with a middle ground formula, not too thick, not too thin. I think the winner for me has to be the Seventeen Stay Time concealer. Probably due to the shade range, and constancy. Although if its super high coverage you want, I’d opt for one of the other two concealers.